Oh how sweet - love the swirls, it makes for great texture!!! I love the runner...great job! The swirls are wonderful! Have a great day!! Beautiful runner! The swirls contrast well with the lines of the tumblers. Good to know about the batting. Lovely work! I am going to request swirls on my next quilting job! LOVE BOTH OF THESE RUNNERS! Love your runner and the quilting. That is a good idea for all over quilting practice, too. Wow, your swirls turned out wonderful. I love all the texture they created. The back is beautiful too! I love your tumbler runner - very pretty. 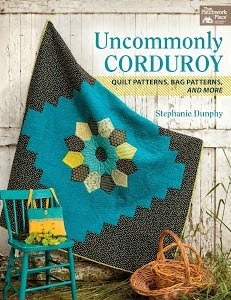 I'm going to try swirls on my next project after seeing this! The Quilter's General Store is on my bucket list if I ever get down that way. I love the tumbler runner!!! I always turned away from the roll of green batting... but now I am rethinking that... if it really is the look that wool can give without the price. thanks for sharing your gorgeous work. 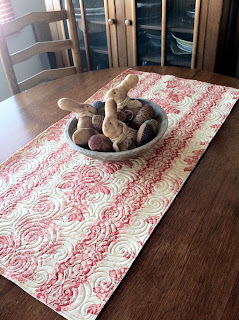 I love your table runner. I wish I could make swirls like that. You quilted it beautifully. Smart girl to make it reversible. . .perfect! Thanks for sharing. Love the swirls! Glad your finding time to squeeze in a few of your own projects. You're so clever, Linda - and so full of wonderful ideas! Sounds like i need to give that green batting a try! It's the year of the table in my house--- I hope to make several pieces for my table...Love this...smart girl with the backing....Beautiful. Great advice with the two runners on one backing. I'll remember that next time, I hope! Also a great idea with the reversible back. Thank you for teaching me some cool new tricks. 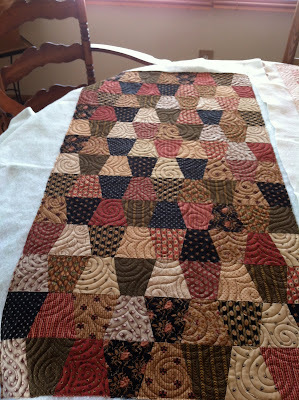 Beautiful quilting and how awesome to do the two runners on one backing. Brilliant. Interesting about your new batting. I have heard of those batts, but haven't tried one. Thanks for sharing! 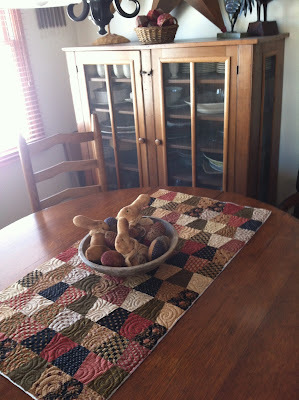 I love your runner, especially that it's reversible! Thanks for the comments about the wadding too, I have seen it advertised and wondered what it would be like to use. Now I know I need to try it! I love your table runner - it is just yummy! 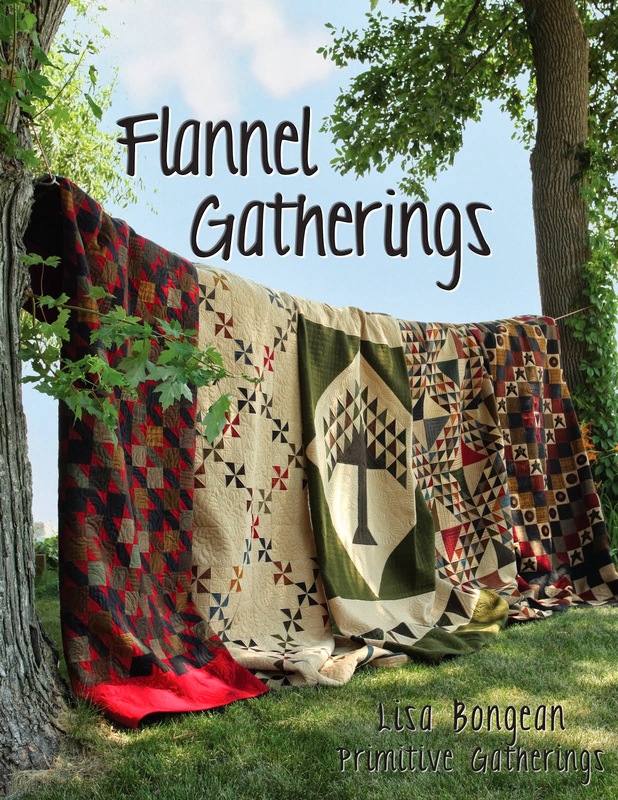 I can't wait for my trip to Primitive Gatherings, and Quilter's General Store is one of my stops on the way! That swirl quilting is awesome :-) And I just love that the runner is reversible! It doesn't get much better than that! You are sleeping enough, right? At 12:30 who knows what kind of designs I would be quilting. They would be going every which way!! 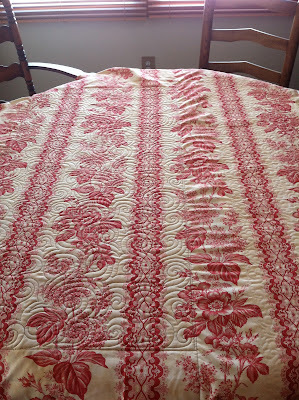 Gorgeous quilting - the swirls look wonderful! Your runners are beautiful.Just a piece of fabric and the perfect quilt design can make a beautieul piece. Glad to hear your customer's quilt made it home. It makes me a little nervous when I think about sending mine to you. I am scheduled for April. Is it looking like it will happen?